I received a array of different products from Fresh Organics which included some for me the mom…whom we sometimes neglect. The first one I had a chance to review were the Bubble Bath Petals. I don’t often get a chance to soak in a warm bath at the end of the day but this gave me a good reason too. So as I ran the bath water I tossed a handful of the Bubble Bath Petals in the tub. 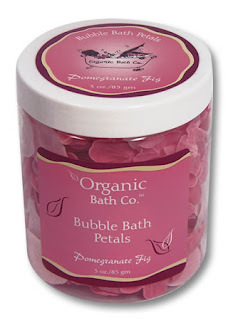 ($11.99) These essential oil-kissed petals and leaves had a very relaxing Pomegranate Fig scent and they dissolved completely creating nice light bubbles to soak in. They also come in Lavender Vanilla. They are sodium lauryl/laureth sulfate free, hypo-allergenic, paraben free and cruelty free. They are made with organic white tea to nourish and protect the skin naturally. A great bath experience for sure. Stay tuned for more reviews on the other products that I got to try out. I encourage you to go to www.freshorganicbaby.com and see what they have to offer.